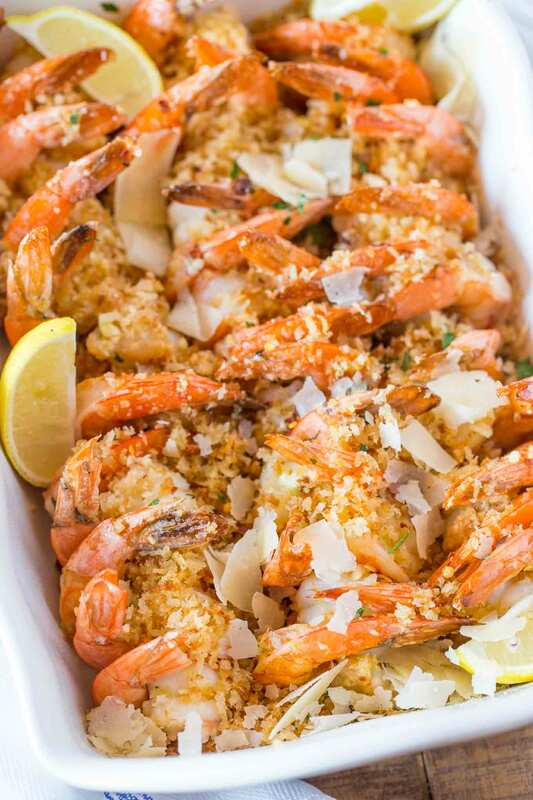 Baked Shrimp Scampi with jumbo shrimp baked in a white wine, lemon and butter sauce with buttery toasted panko breadcrumbs and Parmesan cheese. 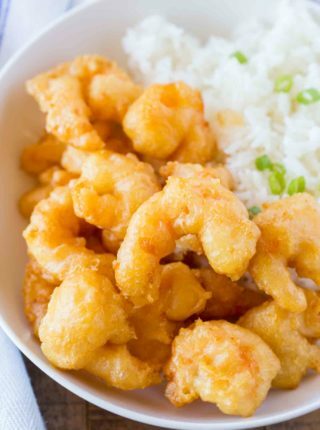 Shrimp recipes are an easy go-to dish for us during the week because they cook in just minutes like Easy Honey Garlic Shrimp, Kung Pao Shrimp and my favorite Shrimp Tempura which has basically the lightest, crispiest crust ever. 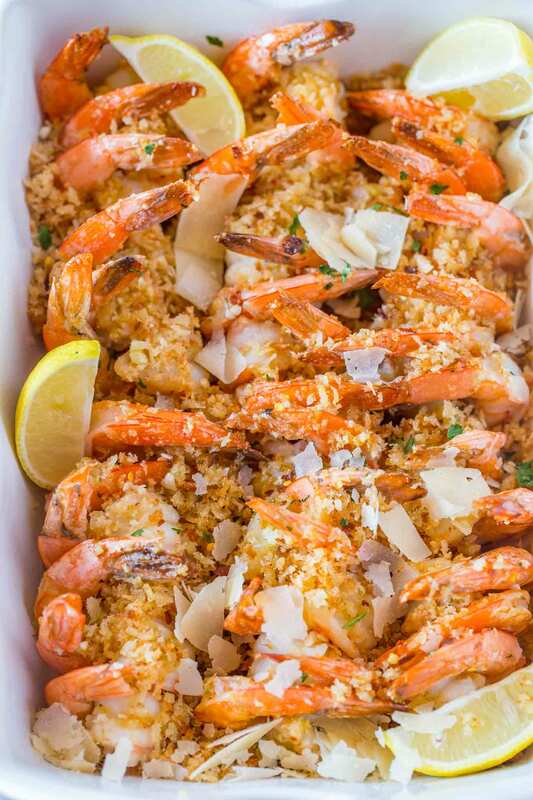 Baked Shrimp Scampi was one of the first I made for friends when I was super young and before culinary school. It is from one of the most entertaining food personalities on television, Ina Garten. She nails this dish and I think it shows, the recipe has probably 1000 five star ratings. I don’t normally cook other people’s recipes on the blog, this has some minor variations to it but otherwise it is her recipe, but it’s so delicious I wanted to include it on the blog. Plus since I shared my classic Shrimp Scampi it seemed only fitting I share this version of it since it’s my favorite version of the classic. 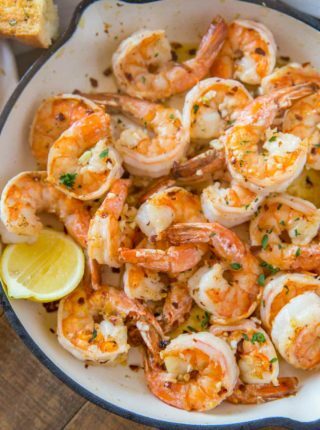 The best part of the white wine and lemon baked shrimp is the topping. Made with panko breadcrumbs, garlic, butter, crushed red pepper, lemon zest and more we love this crust so much we have begun using it on salmon as well as chicken. To crust salmon with the same topping salt and pepper your salmon filet to taste and press the topping gently onto the salmon. Bake in a preheated oven at 425 degrees for 8-10 minutes. The benefit of using panko breadcrumbs in the recipe instead of regular or Italian breadcrumbs is the flaky texture of them. The classic breadcrumbs would create a much heavier crust which would also stay pretty soggy. 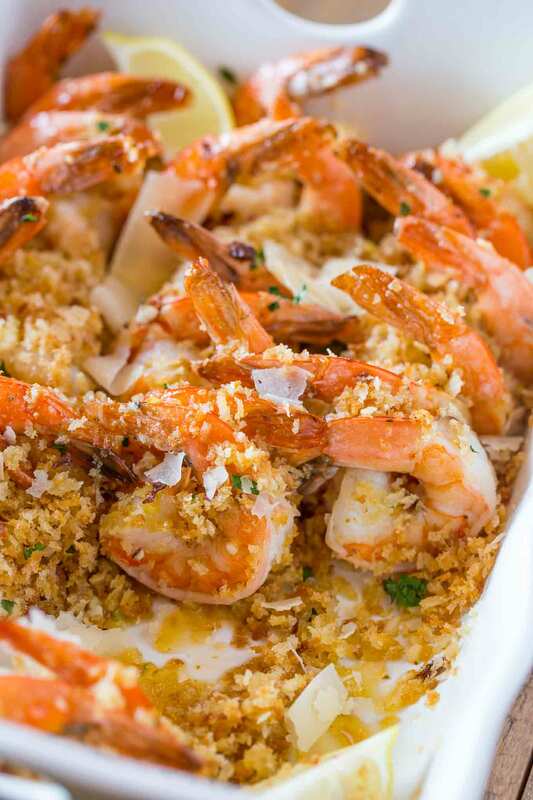 Baked Shrimp Scampi is best served with long pasta such as fettuccini or spaghetti, risotto or even Parmesan polenta. A side of asparagus or roasted vegetables would also round out the meal well. 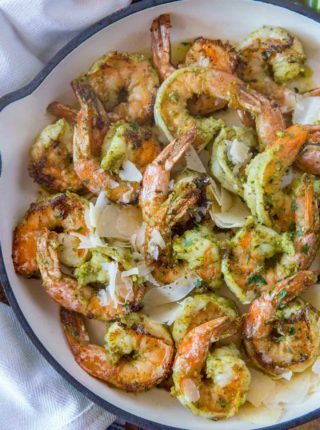 Can you freeze Baked Shrimp Scampi? 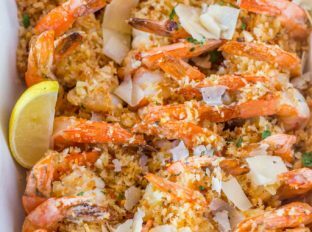 No I don’t recommend making this ahead and freezing as both the topping and the shrimp will lose flavor, texture and tenderness with the freezing process. This dish is best served freshly cooked. So much flavor! Great recipe! Wow! What’s a wonderful recipe and so beautifully presented. I could eat this for dinner every night. I’ve been hungry for shrimp lately! I never thought about baking them. Great recipe! It’s so easy! Hope you enjoy it! My family would really enjoy this!! It looks and sounds incredibly delicious!! The panko crust takes this recipe over the top! 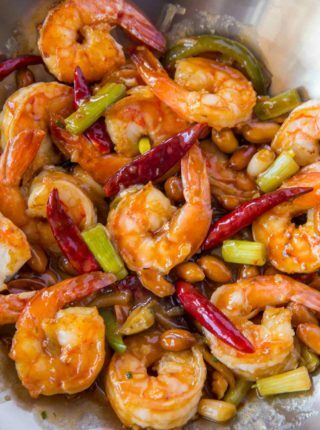 I love the coating on the shrimp, this recipe looks perfect for entertaining! Perfect excuse to throw a party!